The past several weeks have been one of the most stressful periods in my life. And mom's. This time owing to my mother's health. At various points she and I thought my mom won't be alive to see the next week. And finally a couple of weeks ago, a biopsy triggered allergic reactions which led to bronchial and laryngeal spasms. I saw a scene which was similar to one imprinted in my memory from 5 years ago. Mom and I'd gone to Canada for a concert and for the first time, my mom developed what we think was an allergic reaction to milk there. It could have been because the milk was stored in an open container in a refrigerator where they'd also stored raw meat. We both are not really clear what how, but the day we landed my mom had shivers and fever for the entire span of 10 days that we were there. Once back in Chennai we got her admitted into hospital straight away and a battery of tests were on to check everything from malaria to leptospirosis. All of which later came clear. During the course of her treatment, between she was administered a drug on IV, which triggered allergic reactions, her body bloated and she stopped breathing. All this had happened when I was out to buy her juice. I came back to doctors running all around, she was being wheeled into ICU. The next 24 hours I was subject to questions like "Who else is there in your family?" to "Can we speak to someone else?". I thought my mom was gone. They were doing a lot to revive her. And they eventually did. When I finally went into the ICU to see my mother, all I saw was a person resembling a samurai wrestler. Funny as it may sound, her body had bloated to that extent. I had this sense of not telling anyone that my mom was unwell because I didn't want sympathy and wanted to be able to manage things on my own. I was an RJ then, I didn't bunk work nor tell anyone what was happening. I would go from the hospital and come back from the hospital. It was only after the ICU incident when I had to call in and say I couldn't come the next day that my boss knew. And of course, he chided me for not asking for help. I am proud that way. A pride that has passed down from my mother. Of not asking for help or letting anyone know that we are in trouble. Cut to the recent past of 2 weeks ago, she developed allergic reactions to the anesthetic administered for the biopsy, which is said to be normal apparently. And if not for the team of great doctors and a really great friend who I now call "savior man" - Manoj, my mom would have been history by now. To Manoj, I owe a lot more than gratitude and I wish him only the best in the entire world. During the course of the past few weeks, I saw my mother become a child. This, from a lady I have known to be a pillar of my strength, who'd braved battles, who'd taken on the name of a "Tyrant" to protect me and herself (because you see there is no other option that the Indian society offers you. A single woman who is friendly is immediately said to be of loose morals. I think a lot of that tough exterior percolated to me too. I remember friends of mine telling me that no one would ever date me if I have a shield around me that is thicker than a concrete wall. Anyway, that's another story) I saw a lady who thought it would be better to give up. I saw in her eyes that she no longer wanted to be alive. Keeping my sanity was tough. Behaving like everything was normal, tougher. I had a couple of close people I'd talk to. Who were there when needed. And there when they weren't really 'needed', just to silently say, "I am right here". All my life I thought I hadn't had the time to make friends. I have a handful now. And am I glad for them. To you reading this post, I wish you all the happiness in the universe. I also wish you peace of mind, good health to yourself, to your near and dear, enough money to buy whatever you desire, so much love from people that you feel important and wanted, great jobs and in all, a great life. Hello, Chinmayi!! Been a great fan of your profession, and now for your attitude. So sad for what you are going through. Went through the same exactly one year back, when I was about to lose my Grand Father. I can feel the pain you are in. Took me some months to believe that He is not going to be there when I feel down. But, I came out of it, keeping in mind to continue his legacy, so shall you. It is going to be hard, but, you should take it. You have to be happy, because Mom wants that. She's becoming Child, because she's worried of you. You have done whatever you can, and remember everyone perishes one day. Fill the memories in your heart, smile remembering them, move on making memories to your loved ones. Nothing happened yet, but I wish you would take it, if it goes wrong, and don't get down. May you get everything you desire. Wish you lots of health, wealth, love and what not..
May God give you all strength and health to you and your family. Dont. Worry chinmayi. This s not a sympathy kind, god be by ur side always. Take care of padmhasini amma. She s having lot children throughput d world and all their prayers LL give her strength. Above all her DEVI is with her always. It's actually amazing that even after the crap society gave you and your mom you wish everyone well.. It could be so easy to be bitter and say screw you world! That's inspirational and I've got no qualms saying your thoughts have helped me become a better person.. Same goes for tweets from your mom too.. Godspeed to her and I sincerely wish she gets well soon..
Everything will be okay soon akka.God is always there.padmhasini amma will be very fine soon.we'll pray for her.take care.god bless. Be strong, Lady. I am sure we will live through this as well. Lots of Love and Prayers. Even this will go :) Be Bold and everything will be alright. May this new year bring you enough happiness and good things in life. Sincerely praying that your Mom recovers soon! Thanks for your wishes and i hope 2014 is a wonderful year for you..
U are truly inspiring person! I wish your mom speedy recovery and good health. Mean while hang in there,you will get through! first of all wishing aunty a speedy recovery and am sure under ur care and love she will be back to her old self very very soon!!! everytime i read ur blog, i get loads of inspiration...being brought up by a single mom(dad died wen i was young) and being a single mom myself(walked out of my matrimonial house unable to bear the physical n mental tortures that i bore for 8 long yrs), that too to a daughter,i know u def need that tough exterior to ward away the unnecessary evils of the society !!! and also everyone around us will wait for us to approach them wit our troubles for 2 reasons either to take advantage of the situation or to show off that they helped a helpless lady in the time of need !! everytime im down or find it difficult to pull thru life...the next person whom i think about after my mom is, u nd ur mom and pep myself up...love the way u have been brought up with values. 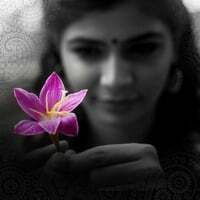 been wanting to write about this for a long time but i also know i wud be boring you with all this stuff...but today being the last day of 2013...i wantd to thank people who inspired me to lead life fearlessly and hence this long post..
thanks chinmayi for being an inspiration to so many women out there in the world. Take care of yourself and your Amma, Chinmayi. Wish you both a very healthy and happy new year 2014. This is the first time i've come across your blog and thought i should drop by to leave a comment. Your voice/songs has always been a stress reliever and i've always admired your personality. Hope your mom recovers soon akka. Society is bunch of people wired to behave in a certain way to certain perception. While we are the ones responsible for ourselves and our people. So I, as a human being first, stand for your peace and joy. Be it indian or western society, those social rules are meant to live in harmony and not to be used for tyranny. At the end, it is love and peace alone is what make you human and divine. I wish you, your mom, and any of your loved ones, an everlasting bliss and joy. May the divine mother heals your mother to a perfect state. This will pass off too chinmayi! Based on tweets by your mom, presume her to be a strong lady with high values and principles. Wish your mom a speedy recovery. wish u a great 2014 ahead. I've been reading couple of your blogs today. Your mother and you are really power women.I salute u for that. And you both are inspiration to many. Wish your mom a speedy recovery. Gud wishes to you and your family n friends too. Hope things are well and hope your mom recovers well. My dad always sing's the song kurai ondru ellai maraimurthy kanna ( M.S. Amma's singing of the song thats sturkes chord).I believe if you have done right things GOD will stand by people during their difficulty.You are one such person.Hope he stands by you during this time, so that you can still bring a smile to people's face with your songs.